This is a beautiful set! Matching set of cups and saucers for espresso. From Aramco Imports made by Casati Fine Porcelain and made in Germany. Each one is a different color with the same gorgeous flower in the center. The flower looks like a pansy to me? Colors are pink, red, blue,yellow, orange and purple. 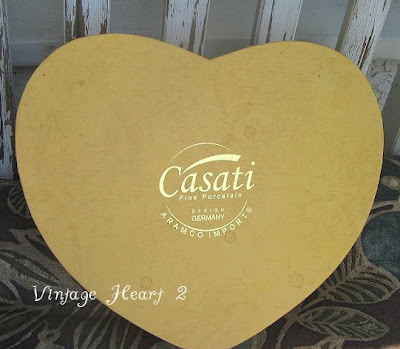 Each saucer is in the shape of a heart with gold gilt trim. The handles on the cups are in a 1/2 of the heart. So beautiful! The set comes in its original box. The top of the box shows some spots but the entire set is in excellent used condition with no spots or damage anywhere. This is a great find! 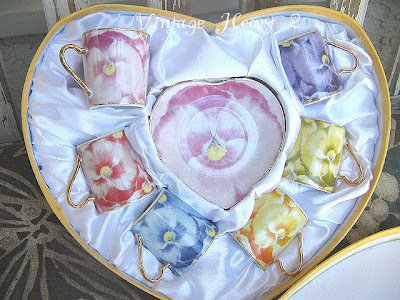 Gorgeous pink heart shaped saucer with matching cup. The handle on the cup is a half of a heart trimmed in gold! 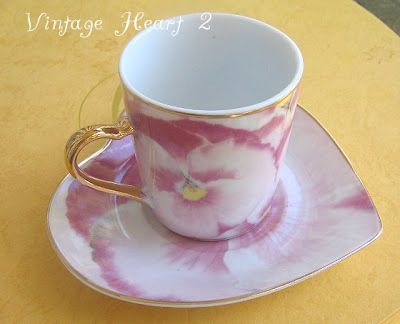 Each matching cup and saucer is a different color with the same flower pattern.